Veggie Samosas recipe by SumeraNawed at PakiRecipes.com. Samosa has been a popular snack all around the world for many years. 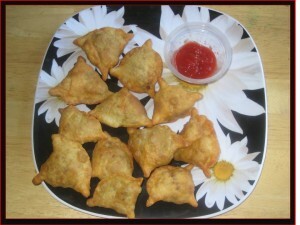 There are many different vairations of samosa recipes. Mostly its the stuffing that changes as you can have vegetarian samosa and meat samosas. Green peas (shelled) 75 gms. Chopped green chili 1 tsp. Dried mango powder 1 tsp. dough and keep it under a wet cloth for 10 - 15 minutes. salt , dry mango powder mango powder" align="middle" border="0" hspace="2" /> and Garam Masala Powder. Stir well. Sprinkle water and cook covered till potatoes are done. Add green peas and cook further for 5 minutes on a slow flame. Add chopped green coriander and let it cool. a little flour and roll them into 4 inch diameter elongated diskettes. medium hot oil till crisp and golden brown. wow can regret must try...! !